Text & Images By Pedro Guimaraes © All rights reserved. Nature provides. There's just something about the sound of water flowing freely in a stream or of frogs singing in the spring. The sounds of nature awaken something deep inside of us. I was on one of my hikes when I heard frogs. I decided to slow down and head their way, but from my experience, every time I approach the body of water where they are; they disappear and get quiet. And the same thing happened, except this time I managed to see one. I decided to sit on a rock at the edge of the water and wait to see if they'd eventually come out. I figured I'd wait half an hour or so. To my surprise in a couple minutes the frogs started appearing and singing! This story could have been much more dramatic if I embellished it and claimed I sat there for an hour, but it wouldn't be true! I call this story Harmony not because of the harmony the frogs were singing, but because of the harmony I seek between myself and nature. I feel that the frogs eventually saw I was no threat and decided to relax and go about their business. They were aware of my presence yet no longer felt threatened. I originally thought the frogs were peeps but it turns out they were wood frogs. During my research I found out that these bodies of water in the middle of the woods are called vernal pools, and some species depend on them for breeding, the Wood Frog being one of them. Vernal pools are natural depressions in level ground that hold water seasonally. The pools are covered by shallow water for variable periods from winter to spring and may completely dry out for most of the summer and fall. They are devoid of fish and allow the safe development of amphibian and insect species. Unfortunately vernal pools are an increasingly threatened ecosystem and are often smaller than the bulldozer used to destroy them. 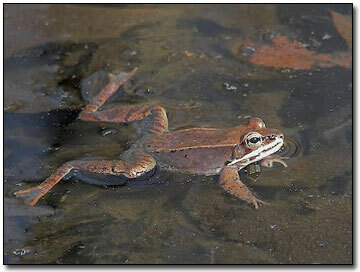 The Wood Frog is a small frog of moist woodlands with a range of most of North America. They spend their life in the woodlands and wetlands, not in ponds or streams. During the winter, they become completely frozen for weeks (with no heartbeat) and then thaw in early spring. They hop their way to vernal pools for breeding, where they mate and lay eggs. Then they leave the vernal pools to spend the rest of the year in the adjacent uplands. This is a prime example of how something so high tech like digital photography can lead to learning more about the natural world. Hopefully this sort of thing happens to many other photographers and inspires them and those who see their pictures to care deeply about preservation.